Pender Island is a southern Gulf Island located in British Columbia’s beautiful Salish Sea. Only a 40-minute ferry ride from Victoria’s Swartz Bay terminal, and less than two hours by ferry from Vancouver’s Tsawwassen terminal, the island boasts scenic beaches, hiking trails, and an abundance of activities. 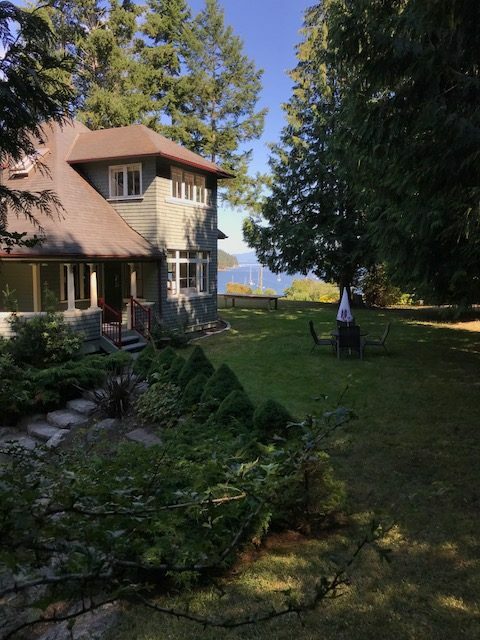 Nosy Point B&B is ideally located in the heart of the Pender Island community, seven minutes by foot from the local shopping area with a bookstore, grocery outlet, liquor store, pharmacy, bakery, and Jo’s Place restaurant. The B&B is across the street from the lively restaurant and pub at Port Browning Marina, as well as Pender Island Kayak Adventures, which offer kayak and paddle board rentals. A lovely, sheltered beach is five minutes from the house. The Pender Island Farmer’s Market takes place every Saturday morning, featuring fresh produce, baked goods, and work by local artisans. The island also boasts a cidery and the award-winning Seastar Vineyards, offering wine tastings and a food truck in the high season. For more information on Pender Island, visit the Visitor’s Guide.